I know summer isn't official over yet but, my mind is already gearing up for fall. 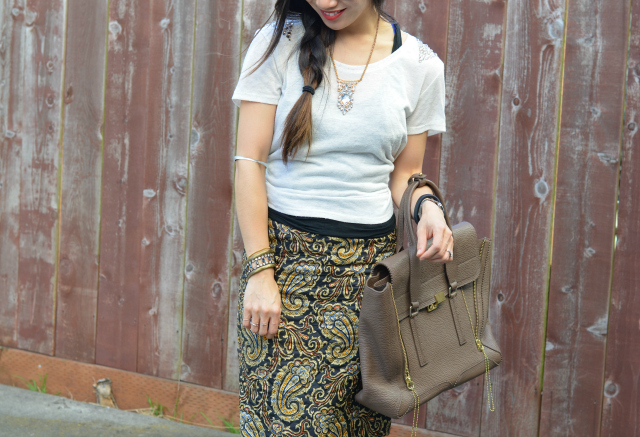 This skirt makes me feel ready to embrace fall with its colors and its pattern. All I'm missing is my pumpkin spice latte. I've already started shopping for Fall! Love your skirt Nancy. That's a lovely skirt. I love the print. I'm ready for Fall too; I'm looking forward to getting my boots out. ack! i don't want fall to come! :) i actually went to the mall yesterday (and i haven't been to one in a while) and i was shocked when i saw fall clothes everywhere :) i love how you did your hair here. the braid is just perfect! This is the perfect 'pre-fall' look! I'm loving that skirt and your sweet yet subtle embellishments! Gorgeous! I love fall. But I love summer. And when summer turns to fall I get kind of sad. I love this skirt! Love the outfit, especially your bag! And I'm totally with you, I'm counting the days for Fall to begin. It's been such a mix. Everyone is talking about fall. I feel like half the bloggers and ready and the other half want an endless summer. Your skirt will transition nicely. I am still not ready for fall - though it doesn't feel like fall here until December. It's nice to be able to wear our tallish color clothes but make it work for the summer. I've kind of had fall in the back of my mind lately too as I shop and take inventory of my closet. The shoes are so cute and the look so comfy too! The pumpkin spice lattes will be here in the blink of an eye! I can definitely see why you get a fall vibe from that skirt, but I think you did a fab job of styling it cool & casual for summer! We are so in love with your pencil skirt!! Is it just us or is that the perfect summer to fall transition piece? Perfection!! that skirt is just so rad!! !